NVIDIA just made a couple of Founders Edition cards that I actually want to buy. 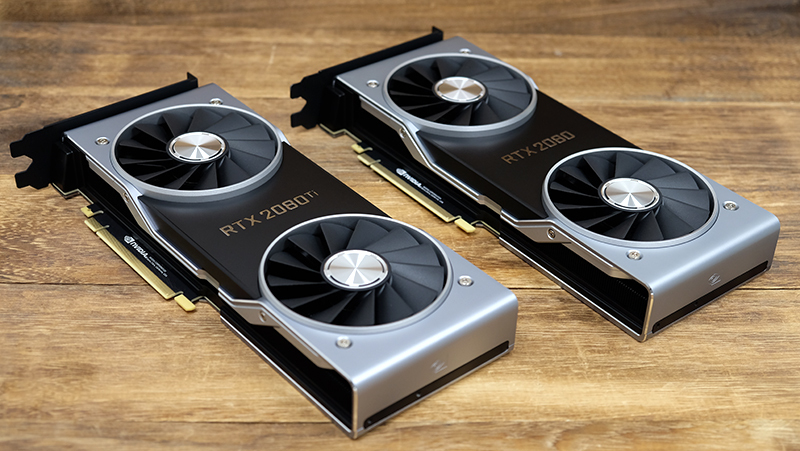 The GeForce RTX 2080 and 2080 Ti were announced to considerable excitement (and a good dose of skepticism) at Gamescom 2018, promising to usher in a new era of graphics technology based around ray tracing. But let's leave talk of performance aside – there'll be plenty of that in the results section – for a second to just appreciate the hardware design. These are some of the most handsome cards I've seen in a while, and their sleek industrial design is a welcome break from the garish RGB freak show on some custom cards. The Founders Edition cards use a machine-finished aluminum shroud that just feels impeccable in hand. There's zero flex anywhere and the card is simply built like a rock. Many high-end custom cards still use plenty of plastic, so the Founders Edition models truly feel more premium. NVIDIA also opted for a wraparound shroud that extends over the end of the card to form a supporting backplate for the PCB. I find this approach more elegant, particularly because the backplate on many cards is still an entirely separate piece from the cooling shroud. This is also the first time that NVIDIA has ditched the blower-style fan on its cards. In its stead, there are now two 13-blade axial fans powered by a three-phase motor that NVIDIA says helps limit noise from vibrations. All told, the dual-slot cooling solution has gotten quite a big upgrade. As you'll see in the next section, cooling performance is much improved over the previous generation. I'll have to see how the custom cooling solutions on NVIDIA's partner products perform, but so far things are looking good for the Founders Edition models. The Founders Edition cards are kept cool by a full-length vapor chamber that covers the entire PCB. Vapor chambers are actually one of the most efficient mechanisms for transferring heat, and heat generated by the card is eventually offloaded to the aluminum fins that span the card's PCB. A larger vapor chamber and heat sink translate into greater surface area for heat dissipation, and the temperature numbers reflect this. 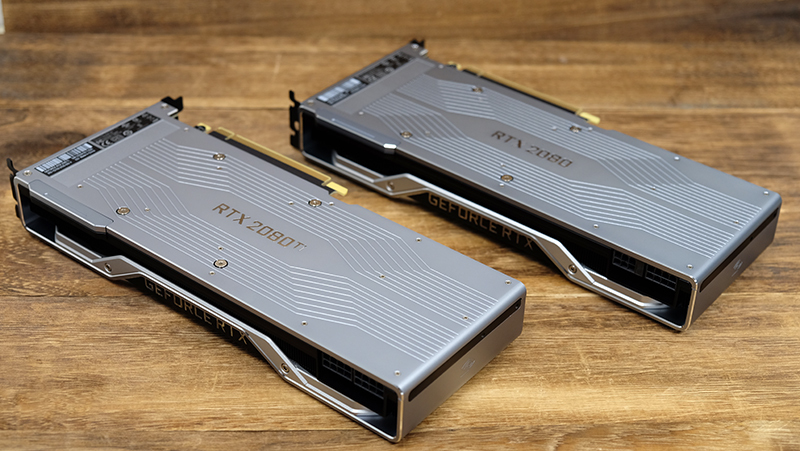 However, there are some differences in power circuitry between the GeForce RTX 2080 and 2080 Ti. 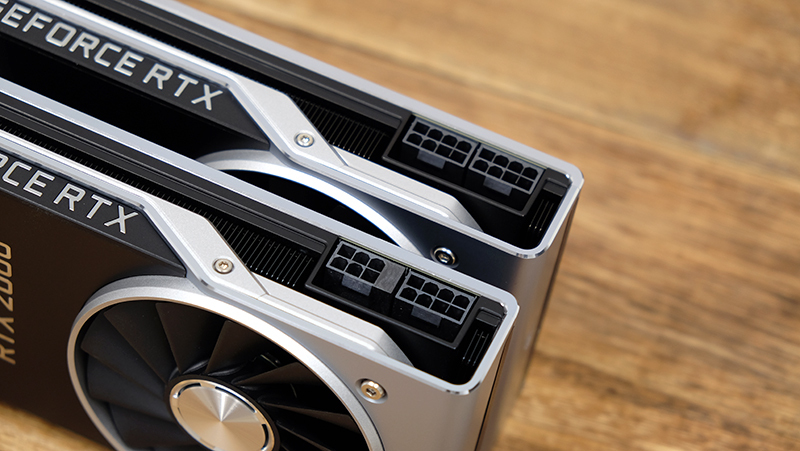 The less power hungry GeForce RTX 2080 is equipped with an 8-phase iMON DrMOS power supply, whereas the flagship Turing card has a more robust 13-phase design. That said, NVIDIA says they both use a new dynamic power management system that is capable of sub-millisecond current monitoring and control, which lets the power supply more tightly regulate the flow of power to the GPU. One nifty feature is the ability to dynamically switch to using fewer power phases when the power subsystem isn't fully loaded. Fewer power phases are better at low current loads, so this lets the power supply run at peak efficiency when the card isn't working that hard and scale up only when the situation calls for. 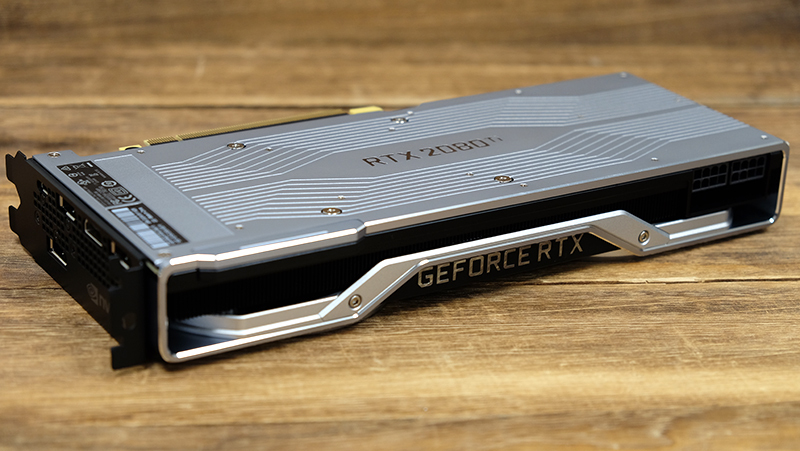 On top of that, the GeForce RTX 2080 has a 2-phase power supply dedicated to the GDDR6 memory, while the GeForce RTX 2080 Ti boasts a 3-phase design. 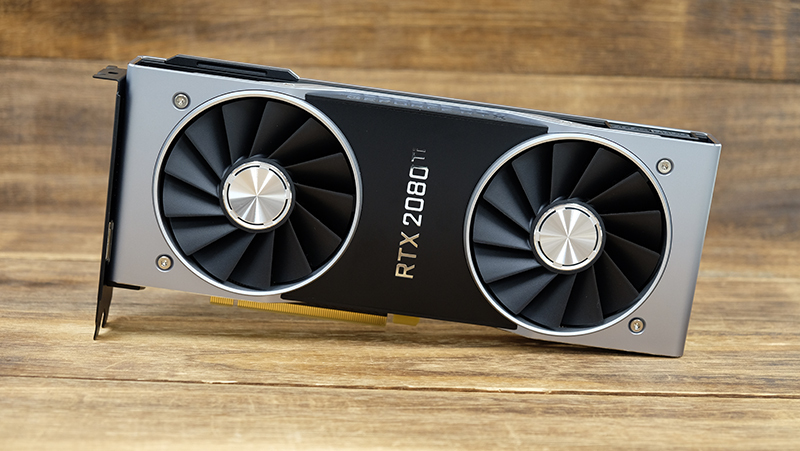 In a departure from tradition, the GeForce RTX 2080 Ti Founders Edition will also ship with a 1,635MHz boost clock, a nice increase over the 1,545MHz reference specification. Similarly, the GeForce RTX 2080 enjoys a 1,800MHz boost clock, versus the stock 1,710MHz speed. NVIDIA has added something new to the card's outputs as well. It features an HDMI 2.0b connector and three DisplayPort 1.4a outputs that can drive displays up to an 8K resolution at 60Hz. However, it also comes with a USB-C port that supports VirtualLink, a new open industry standard being developed to meet the power, display and bandwidth demands of the next generation of VR headsets through a single USB-C connector. 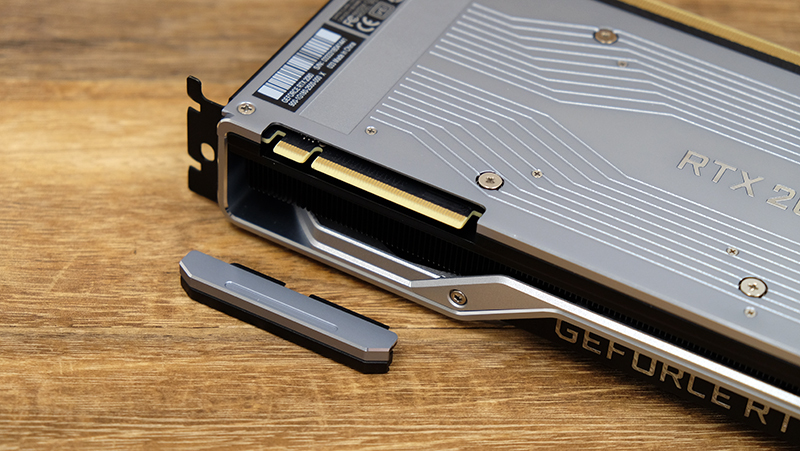 Finally, the NVLink interconnect is protected by a removable cover, a nice touch that gives the card a more seamless look when you aren't planning to go down the SLI route. These are the first consumer GPUs to use NVLink, which makes available two x8 links compared to just one from before. However, you'll have to purchase your own NVLink bridge from NVIDIA if you want to run more than one card.